Sammy, I miss you a lot. Oh Sammy, we are so sorry you had to fly away to that bridgge, and we do miss you terribly. I know your humans do too, but at least they have kept your blog going. Rest in peace pal, and we'll enjoy your bacon for you buddy. 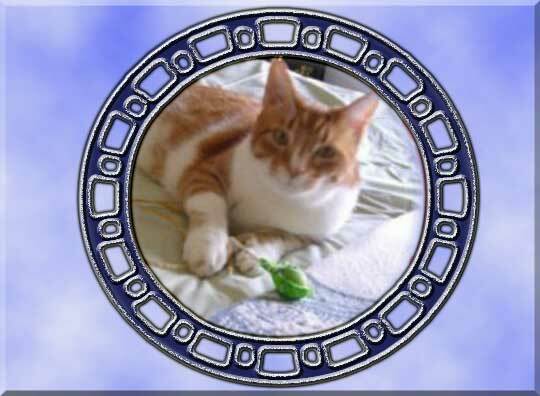 We have been meaning to let you know how sorry we are for the passing of your precious Sammy, your love for him was always so palpable and we send you our very gentlest purrs and hold you in our hearts. Sammy, the world lost a bright hining light when we lost you. RIIP our Christmas loving buddy, I am sorry you didn't have one last Christmad Day with your Mum and Dad. Thank you everyone for your kind and sweet notes about our Angel Sammy.....we miss him every second of every minute of every hour. We all miss our Angel friends and I hope all of us can fine some peace in knowing those at the Bridge are FREE. Sammy, we miss you so, so much. We know you're watching over us all now, and take comfort in the fact that you and Mom will see each other again one fine day. Big hugs and headbonks and purrs or comfort to your Mom. Sammy, we know you broke your mom's heart when it came time for you to leave. You are missed by so many but your blogging continues from the bridge. Purrs and paw taps.